Peeps | Let Teddy Win! Teddy wins Peepsidents Race in Post diorama contest. Voting open now! The Washington nationals presidents race received a fitting tribute in an entry to this year’s Washington Post Peeps Diorama contest. 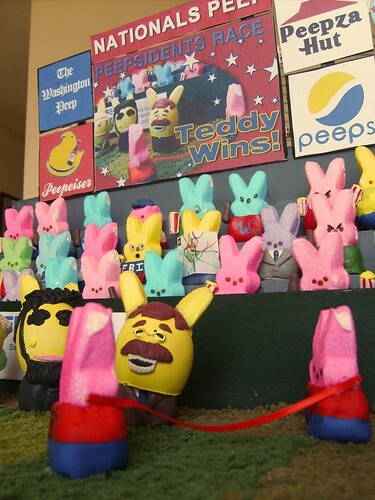 The entry, titled “The Peepsidents Race” and depicting a Teddy Roosevelt victory, was selected as a semifinalist from over 1,100 entries to the popular annual contest. The Post’s chosen winner was an equally-inspired send-up of the movie “Up,” but the People’s Choice voting opens today, and the Peepsidents have collected quite a few votes already. You can view the gallery and place your vote here (click on the “Peoples Choice” link). 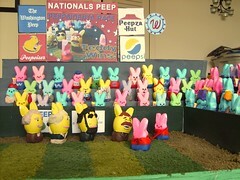 The Peepsidents was created by DC resident Morgan Barr and a team of coworkers at the U.S. Office of Trade Policy Analysis, who turned to this site to watch videos of past presidents races, and included a number of painstakingly-created details from Nationals Park (or “Nationals Peep,” as the diorama scoreboard states). Ads on the scoreboard include The Washington Peep, Peepeiser, Peepza Hut, and Peepsi. Of course, it wouldn’t be the presidents race without oversized heads, so the team expanded the heads of the four racing peeps using plastic eggs.